Symptoms: Score reels sticking, not resetting, 50 and 500 points items not scoring, not always advancing to next player or ball, bonus countdown issues, score accumulating when switching players. The machine has been missing the rear door for the backbox for a long time and a lot of dust had settled in there. The switch contacts on the player unit needed cleaning and adjusting. This accomplished a lot in eliminating problems. The score advancing when changing players was due to the reset contacts (switch stacks P3 and P4) vibrating or set too close. The player unit keeps track of ball numbers, player turns, and controls the reset of the scores. What makes working on the player units difficult is that the switch stacks are very close together. I’ve made a home-made switch adjusting tool that is able to fit in between switch stacks. I’ve also made some cleaning strips with a jogged shape them to help with switch cleaning. Some of the decagon units needed to be rebuilt and contacts cleaned. A majority of the time was spent in the backbox. The owner will craft a new back door to help keep the dust out. There were a few other mis-adjusted contacts on the bonus unit and the 50 and 500 point relays. Another EM pinball machine saved. Symptoms: Machine not resetting, points not registering, drop targets not resetting, bad light socket, and various other problems. This is the rarer electro-mechanical version of this pinball machine. On most EM machines, you can disconnect the credit subtract coil to put the game in Free Play mode. However, on this machine, there are switch contacts on the credit subtract lever that trigger the Start Relay (S). I bypassed those with a wire. Next, the relay coil spring on the Reset Relay (AX) had been previously replaced with the wrong one that was much weaker. I traded the spring from the Hold Relay, where the spring tension is less critical, to the Reset Relay and then re-adjusted the contacts. This fixed the problem with the machine not resetting correctly. Next, many of the point scoring relays such as the 500 point and 5000 point were not holding though a cycle of the score motor. They are all common and routed through the normally closed Motor 2B switch. This switch was simply out of adjustment. Eight relays are routed through a common hold switch on the score motor. 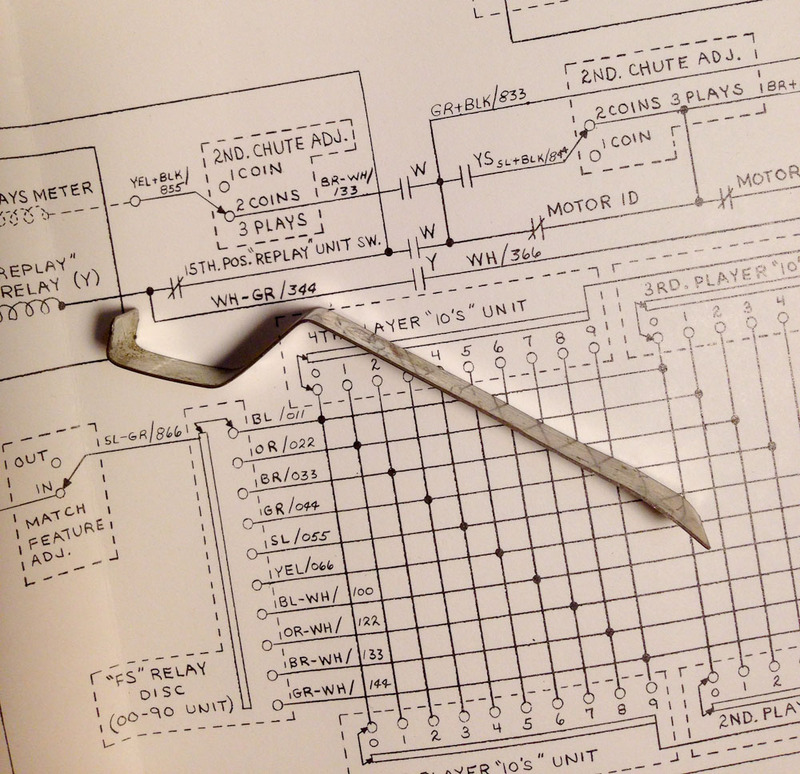 One of the formed switch blades had broken off the score motor and a replacement was obtained from The Pinball Resource. Broken formed switch blade from Score motor. Some of the contacts on the player unit needed to be cleaned and adjusted, which is a typical problem with Gottlieb multi-player machines. The bonus stepper unit was gummed up and not advancing or awarding bonus. It was cleaned and rebuilt. The spinner switch needed adjusting because it was scoring points with just vibration from the playfield. After replacing a broken light socket and spraying the back side of the backglass with Krylon Triple Thick Clear Glaze (to help stabilize the paint and keep it from peeling), the machine was looking and working great! Symptoms: Pinball machine wouldn’t reset. A machine not resetting is the most common problem with an electromechanical pinball machine. In a way, it’s like a self-test, because a lot of things have to be working for the machine to reset. The reset sequence is like a series of dominoes, one item affects the next item and so on. If one item fails to reset, then the sequence is either halted, or more likely, gets stuck in a continuous reset cycle. This Fast Draw had been not working for nearly 12 years. And typically with an EM machine that hasn’t been used for years, it usually needs some contact cleaning, contact adjustment, and the steppers rebuilt. 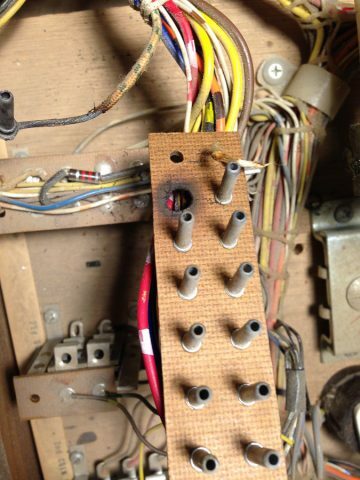 This particular machine also had a broken wire associated with the reset relay. Symptoms: A variety of things not working. The Williams Moulin Rouge is an electro-mechanical (EM) pinball machine from the mid-1960’s. The owner has owned this game for over 30 years. However, the game hasn’t been used in over 8 years. When I first opened the machine, I saw some disconnected wires dangling from the playfield. These were associated with the left flipper. I re-soldered these wires to their respective places. In the backbox, there were a couple of steppers that were sticky and needed to be cleaned. The ball count stepper and the match stepper. Even if a pinball machine has been set for free-play, the match stepper is important to have working. The match stepper is used continuously throughout a game and is triggered by various switches in the playfield. In this case, it controls various playfield features that alternately illuminate. The machine wouldn’t power up due to a broken in-line switch that had been placed on the line cord. I replaced the line cord, which had been previously spliced and installed a better quality switch. Originally these games didn’t have power switches. To turn the game off, you kick the bottom of the machine, which trips a “kick-off” switch. To turn the game on, you press the left flipper button. Kicking the bottom of the machine is awkward, so I prefer an in-line cord switch. Once the machine was powered up, it was in continuous reset mode. This is not unexpected with an EM game that hasn’t been used for a while. A game will get stuck in reset mode when something isn’t detected as being reset. In this case, the score reels were not being reset. They were sticky and not turning freely. Also, there was a dirty contact that was preventing the “100” digit to not get the reset pulses. Once the score reels were fixed up, the game would reset. The next thing I noticed was that the outhole wouldn’t register a ball after the first ball. Therefore it wouldn’t give an end of ball score, wouldn’t advance the ball count stepper, and therefore wouldn’t eject the ball to the shooter lane. After checking the schematic to see what else was in that circuit and manually tripping the outhole relay, I noticed the scoring motor wasn’t indexing to its home position after either a trigger of the outhole relay or the eject relay. It turned out to be a couple of dirty contacts on the score motor bank that were supposed to keep the score motor running until it was indexed. Next up, there were many lamps not working. This wasn’t because the bulbs were burned out, but because the sockets and the lamp bases had corrosion on them. Next up, the right slingshot wasn’t working correctly. As the slingshot arm would kick the ball, it would get hung up on the playfield plastic over it. The plastic was warped. I placed washers under the plastic to raise it up high enough so it wouldn’t interfere with the slingshot. I replaced all of the rubber pieces on the playfield. The left flipper needed a new bushing and was missing its torsional return spring. The right bushing was okay, but both will be replaced on a future visit. All in all, this was pretty typical work for a pinball machine of this vintage and the years of non-use. People always ask me for estimates on this kind of work. It’s very difficult because you have to start fixing things to see what else doesn’t work. But it’s almost always in the 3-6 hour range. Symptom: Not powering up, not working. This pinball machine is located in a youth center in a church basement. No one seemed to know much about it, other than it was probably donated. So it was unknown when it last worked. Given the age of the machine, before powering it up, I checked the mechanical operation of all of the steppers and visually checked the contacts on the relays and score motor cams. Several of the steppers were gummed up, but the rest were in good condition. I rebuilt the steppers and fixed the left slingshot linkage which was binding. We had to drill out the lock in the back box because no one had a key and we couldn’t find one in the machine. Once all of the mechanical parts were working freely, I powered it up. The machine would get stuck in continuous reset mode. The reset cycle description in the manual was nearly incomprehensible. So I was on my own. I checked all of the obvious things, like the score reels resetting to zero, the ball count stepper unit, player count stepper unit, etc. Everything was being reset and all reset switches were working. The only weird thing was the credit stepper was stepping up to the maximum allowed credits during reset, when it should be subtracting 1 credit. It occurred to me to check the coin switches, which I hadn’t checked earlier. They were a mess. I think someone thought they could get freeplay mode by bending all of the contacts together on both coin inputs. Once I got the switch wires and contacts untangled, the machine would reset properly. I bent the switch contacts on the credit unit to give free plays. After that, there was still some minor tuning needed and got 98% of it working well. I discovered a broken switch contact on the Spinner Advance Stepper (EOS). 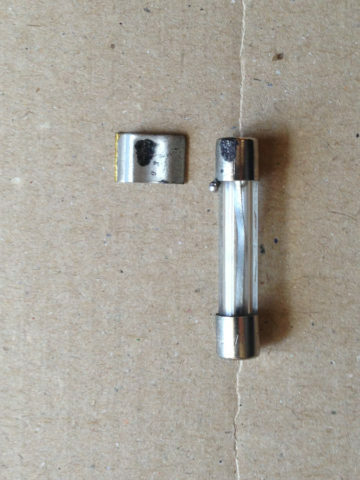 It was broken right at the insulator which prevented me from soldering another contact on. I am currently researching a replacement switch or contact. I will update when this is done.